Nestling between the dramatic landscape of the southern Lake District and the rolling Yorkshire Dales, South Lakeland Leisure Village is an exclusive development of superior holiday homes and luxury lodges. Set around a picturesque lake in 43 acres of beautifully-maintained grounds, this award-winning village offers a convenient and affordable way to escape to the North of England – whether you are looking to holiday in style or for a beautiful second home built to exacting standards. 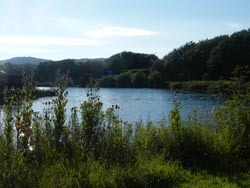 The lake offers some excellent pike fishing, with specimens up to 30lb present. There is no point fishing for anything else, as pike are the predominant species here.